Just in case you didn’t know (and I wouldn’t be surprised if you didn’t) Jorn Lande is ‘The Norse God of Metal’. He is very successful abroad, having fronted the bands ARK, The Snakes (which featured ousted members of Whitesnake), Masterplan and his own band Jorn. Lande is from the school of Coverdale, Hughes, Gillian and Dio, so it comes as no surprise that he has recorded a tribute album to Ronnie James Dio who recently succumbed to cancer. The big question is how will such an effort be received? As I stated, most people in America haven’t a clue who Jorn Lande is and as a result it might not go over very well. The good news is that Jorn is a phenomenal vocalist and he does each track justice, and frankly it would make Ronnie proud. 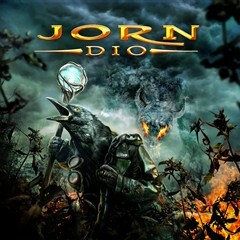 I’m curious to see if Dio is the album that finally catapults Jorn to the next level in North America. I don’t know how I’ll feel about that — I love the guy’s voice and would love nothing more than to see him get his due, but I think I’d feel disgusted if he went on to become Eddie Trunk‘s ‘boy’. That just might happen, given the fact that Trunk proclaimed himself a good friend of Ronnie‘s and with Lande and Hughes fronting Heaven And Hell at The High Voltage Festival in London — there’s no escaping such an event. Dio features some surprises in “Invisible”, “Shame On The Night” and current Dio classic “Push”. There are some predictable moments from Jorn covering Dio though, as in his third recording of the brilliant “Lonely Is The World/Letters From Home”. This song will be a treat for the newcomers, but for the rest of us that have followed Jorn for years it may leave you scratching your heads. The same applies for “Kill The King”, which last surfaced on 2007’s Unlocking The Past (where “Lonely Is The World/Letters From Earth” first appeared). This leads me to the best moments of Dio — Jorn selected some great tracks to cover, but “Sunset Superman”, “Night People”, “Scared Heart”, “Stand Up And Shout” and “Don’t Talk To Strangers” really hit the spot. These tracks are a glorious tribute to the man with the gigantic voice. I strongly encourage you to pick up Dio as it’s a wonderful snapshot of Ronnie James Dio‘s work done in a respectful, tasteful and classy manner.